Latest forecast on the mid-week storm(s): some snow, then ?? 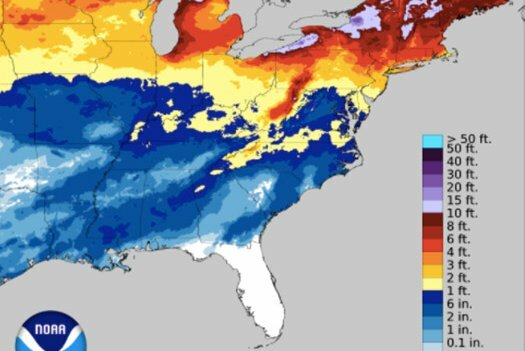 This national snowfall analysis by the National Weather Service's National Operational Hydrologic Remote Sensing Center shows how much snow has fallen this winter season. As of Sunday, Philadelphia has seen 22.2 inches of snow so far this season, about 1.1 inches more than normal and more than 7 inches more than last season. Weather models are hinting that significant snowfall is unlikely from a mid-week, two-part storm, but forecasters warned it's not out of the question. First, a low pressure system over the Midwest moves east through the Tennessee Valley on Monday night, sparking development of a coastal low near Norfolk, Virginia, which then likely moves to the northeast and out to sea. Precipitation will move into southeastern Pennsylvania and South Jersey late Monday night. A very sharp cutoff in precipitation is likely to the north, forecasters said, though models differ significantly on where exactly that occurs. 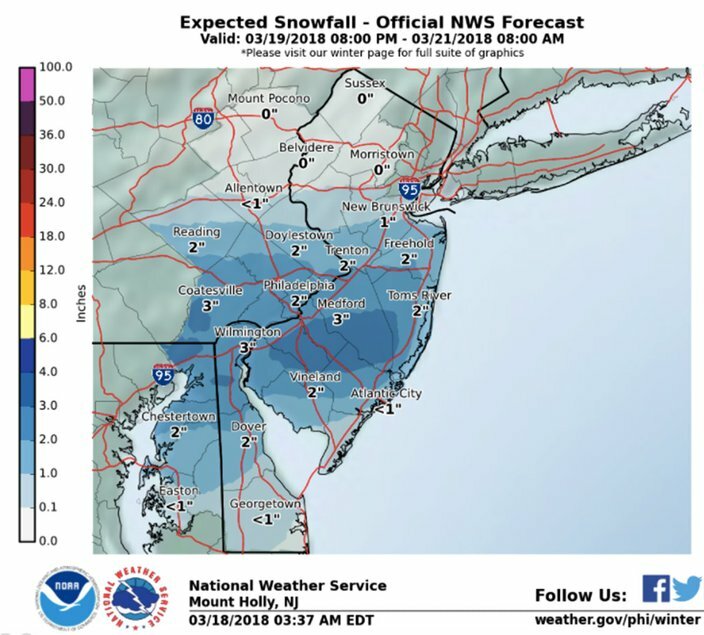 Models are in fair alignment, however, that we will see mostly snow – from 2-3 inches – late Monday into the overnight Tuesday in the Philadelphia region, with a rain-snow-sleet mix likely in southernmost South Jersey, forecasters said. This expected snowfall forecast only covers the first part of the storm and the early portion of the second part. The precipitation looks to break late Tuesday afternoon into the night, setting us up for Part Two just hours later. Late Tuesday night, a second coastal low forms near the South Carolina-North Carolina border, according to forecasters. Models don't quite agree on the track of the low. If it moves up the coast, the region would see heavy wet snow and strong winds. If it moves out to sea, only coastal impacts are likely. "With support for both of these polar opposite solutions in the ensemble systems and with high uncertainty in the forecast, it's still premature to rule out either scenario for the second part of this event (i.e., a complete miss or a high-impact nor'easter)," the weather service wrote in its Sunday morning discussion. If the region were to be hit by significant snowfall, forecasters warned that extensive power outages are possible in the aftermath of the damage caused by the two earlier nor'easters this month. And, yes, another storm system could impact the region next weekend, forecasters say. Sunday: Sunny, with a high near 52. Northwest wind 11 to 13 mph. Sunday night: Mostly clear, with a low around 31. Southwest wind 3 to 6 mph. Monday: Sunny, with a high near 48. North wind 5 to 7 mph becoming calm in the afternoon. Monday night: A slight chance of rain and snow between midnight and 2 a.m., then a chance of snow. Increasing clouds, with a low around 32. East wind 5 to 7 mph. Chance of precipitation is 40 percent. New snow accumulation of less than a half inch possible. Tuesday: Snow likely before 1 p.m., then snow likely, possibly mixed with rain. Cloudy, with a high near 39. Northeast wind 11 to 14 mph, with gusts as high as 25 mph. Chance of precipitation is 70 percent. New snow accumulation of 1 to 3 inches possible. Tuesday night: A chance of snow, mainly before midnight. Mostly cloudy, with a low around 31. Chance of precipitation is 30 percent. Wednesday: A chance of snow before noon, then a chance of rain and snow. Mostly cloudy, with a high near 39. Chance of precipitation is 40 percent. Wednesday night: A chance of snow before 11 p.m. Mostly cloudy, with a low around 30. Chance of precipitation is 30 percent. Thursday: Partly sunny, with a high near 44. Friday: Mostly sunny, with a high near 46. Friday night: Mostly clear, with a low around 30. Saturday: A chance of rain. Partly sunny, with a high near 44. Chance of precipitation is 30 percent.